Buddha’s words are very popular, even to this day. There are many books available, and every once in a while they become trendy again. 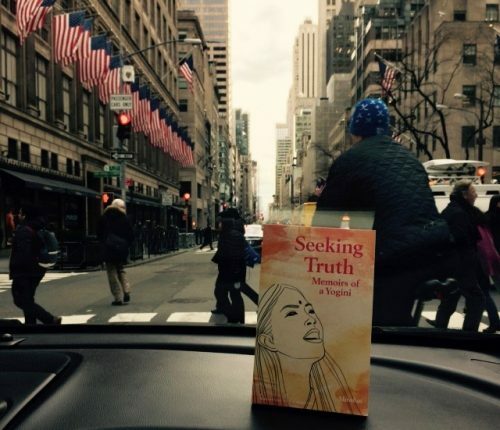 Perhaps people who buy these books or search for them on the internet are trying to get answers or hints about how to deal with the concrete personal problems they are facing, their vague or general anxiety, or the various doubts they have in life. Especially when people look for words from people who are considered to be Holy Beings or saints, such as Buddha, I suppose that they are looking for salvation in the form of an immediate remedy or some relief from an emotional problem, such as an answer to their anger, sadness, or their pain. Looking at books with titles that have words like, “The Words and Teachings of Buddha,” etc, they are often edited in such a way as to meet the above needs. The fact that these books sell so well implies that those needs exist, and that Buddha’s words are consumed based on those needs. However, when you read Buddha’s words (i.e. the most ancient Buddhist scriptures) just as they are, we can see that Buddha never uttered words based on a temporary remedy or for comfort or relief, nor did he just answer with something that the questioners expected to hear. Take as an example the famous story of Kisa Gotami. We can see in this story that even to this mother, who had lost her child and gone mad, even towards the person who most needed such an immediate remedy, he did not simply tell her words of consolation, but rather guided her in such a way that she could think for herself and recognize the truth of the world. Footnote : Buddha told her to bring a mustard seed from a family that had not had any deaths. She searched for it but could not find any such house. When she returned to Buddha, Buddha then taught her the Truth. And she became his disciple. Even when it comes to thinking and translating his words into action, to those who came to him with an attitude of, “I can’t get into action unless I understand the meaning of that action fully,” Buddha did not give the immediate answer that was expected. The famous example of this is the analogy of the “Poison Arrow.” To a disciple who asked, “Is the world eternal or not?” “Is the world limited or limitless”—he did not give an answer that the mind of his disciple wanted to hear. Footnote : This is the teaching that one should first remove the arrow, rather than over-analyzing where the arrow comes from and the details of the arrow. Indeed, we are expecting the “magic mantra” that gives comfort and relief from the words of Buddha. We want that instant comfort, as if we could be healed immediately from being hugged by a saint. That is why once our minds feel comfort, we forget about Buddha. Then we fall into the same suffering and sadness again. I think that we are all used to getting an immediate answer. On TV, we see the conclusion within 30 minutes to an hour of a show. If we search for anything on the internet, some kind of answer-like things are found. We don’t have the endurance to continue to seek something that is “difficult or perplexing,” something that doesn’t have an immediate answer. However, the issues we face in life are nothing like workbooks from school, where the answers are written at the back of the book. Rather, it is required to face any unanswered questions head-on, and come up with our own answers by thinking them through for ourselves. It’s not as simple as being able to solve the problem because you were taught the right answer. It’s not as simple as just asking Buddha or the saints for an answer, and then thinking as if everything is fine once you get the answer from them, without going through the process of examining this within ourselves. It doesn’t work this way. This is all the more true considering the way Buddha taught and guided people was correct. The salvation that Buddha performed was not by means of just giving words of comfort or healing to the mind, or of some method that was immediately useful. Considering this, I suspect that the type of books entitled something like, “Heal Your Mind Just by Reading Buddha’s Words or Sayings” are different from what Buddha intended. I suspect that the words of Buddha are not like something you would expect to have the result from the feeling of “I really got a lift from reading this book, which we often hear these days, even though this was not Buddha’s intention. Temporary comfort may provide an effect just like that of pain-killers, which suppress suffering, or like anesthesia, but it does not have the lasting effect that completely eradicates the confusion of the mind. Even if Buddha’s words contained continuous guidance, if we just take his words for the part that is convenient for us, against his original intentions, then we are merely projecting our own minds’ hopes onto it. To just remain satisfied with oneself only by reading a book, or not thinking further about the teaching after hearing it, is the same as taking a pain-killer only for the temporary relief and then never going back to the doctor again to get the fundamental approach for treatment. Originally, the teachings of Buddha or of Yoga were devised to prevent us from just being satisfied by listening to them. (For example, Buddha never answered “what he realized” or used any particular name for God.) However, if we stop once we are satisfied with only the part that we have selectively and conveniently taken from his words, then it is quite possible that the continuity of the process in which we shift and transition into the step of “thinking” is cut off. So instead, we must think about the question, “What was it that Buddha meant?” and, “If I am to transfer that into my own action, how should I do it?” Or we must confront whatever incongruity we have within ourselves, or any fear we feel, or ego that arises from within us when we hear these words. And with utmost seriousness, as if we are in a real duel with a “real sword,” we must challenge our mind in a showdown between the mind and Buddha. No matter how gentle the words of Buddha are, if we really try to grasp their true intention, to approach the state of Buddha who uttered these words, and to actually put them into action, then we will need an appropriate, or rather, an incredible depth of contemplation and inner struggle. For example, can we really understand Buddha’s state of mind when he said, “It is better to live one day seeing the state of Deathlessness, than to live a hundred years without seeing it” (Dhammapada, Verse 114)? Even if it’s not the state of Deathlessness, do we even have something that we can stake our lives on? We say that family is important, we say that work is important, but can we really say that we’d rather see our family’s face one day than live for a hundred years? Or can we say that we don’t care if we are demoted or unpaid if we accomplish one important project at work? When we consider these things seriously, that’s when various things arise within the mind and a serious battle occurs as the mind is dissected and laid bare. We must not stop at just being complacent with hearing the words and teachings. Then there would be no point as to why Buddha uttered these words. Buddha’s words will only become effective when we transition from “hearing” his words to “thinking about” his words. Buddha’s words are words that have that intention underlying them. The salvation that comes through Buddha is not just a temporary relief. It is not a pain-relieving anesthesia that allows us to turn away from reality. It is not about remembering the right answers. It is about acquiring methods for resolving problems. As Buddha explained at the end of the analogy of the “Poison Arrow,” it is to acquire the teachings of the Four Noble Truths—Suffering, its Cause, the Elimination of its Cause, and the Path for eliminating that—so that we can apply them to every problem that arises, be it in meditation or in daily life. Then, by being able to cultivate the power to solve these problems by ourselves, we are able to acquire sustainable help and salvation. Swami Vivekananda, a Yogi who understood Buddha best, in my opinion, said that there are three types of help that we can give to others: material, intellectual, and spiritual. To feed the hungry is a type of material help that is needed immediately. However, the effect of that help is short lived. It will only relieve their suffering for a moment. Intellectual help does have more continuity. By receiving specialized knowledge or techniques, a person can find a job and sustain his or her own livelihood. And I think that this “intellectual help” itself is equivalent to the “think” part of the “hear, think, and meditate.” It is the ability to continuously resolve issues by oneself without having to depend on others. If we just stop at the level of “hearing” and do not proceed to “thinking,” then it is like we keep lining up at the soup kitchen, but we never go get a job. In that moment, the stomach fills up. But the next day, we get hungry again. Buddha can give us help to even go beyond the intellectual level, to the spiritual level, yet if we continue to return to the soup kitchen for bread, it feels so sad. In comparison, as we live in modern Japan, I think that we are getting to the point where we do not really need material or intellectual help as the first and foremost thing from Buddha or from Yoga. If that is so, then we should really seek help from Buddha as he originally intended it to be. Not only remaining at “hearing,” but continuing on to “thinking” and further leading to meditation—that is the salvation that is continuous and everlasting. The time is now. Now is the time to truly know Buddha. and came to experience the Truth firsthand. Part I contains her memoir and Part II contains the teachings of Yoga. May this coming visit to Taiwan awaken in the hearts of the people their inherent yearning for Truth, for Yoga, and may those who have had the great blessing of meeting Shri Mahayogi already carry that seed of Truth in their own hearts and spread it far and wide, to the people of Taiwan and beyond! Graciously responding to the request of disciples and seekers in Taiwan, Shri Mahayogi will soon visit Taipei. The first time he visited Taiwan was in May 2017, so this will mark his third visit within one year! Surely the people of Taiwan must truly hunger for the Truth in order for the yearning of their hearts to draw the Master back once more this year. This month’s issue of Pranavadipa (Volume 40) contains the third of four Satsangha that were held during Shri Mahayogi’s first visit to Taiwan. We believe that for our subscribers in Taiwan this translation will be especially good to read as a reminder in preparation of the Satsangha before Shri Mahayogi’s arrival! And of course, for all of our subscribers, this Satsangha serves as an inspiration for all who thirst for answers. 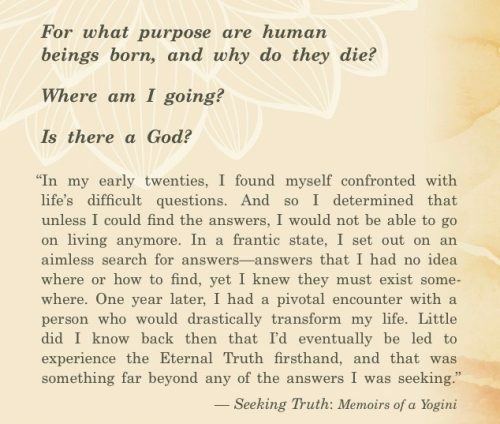 The questions contained within seem so simple and straightforward, yet they come from a profound place of true seeking. Within the interactions between attendees and Shri Mahayogi, there is no pretense and it feels as though attendees are really looking for practical guidance of how to apply the practice of Yoga in their everyday situations. And all attendees seemed to be intensely drawn to Shri Mahayogi, simply because of his existence, taking very seriously the opportunity to meet a living Master of Yoga, not knowing whether the opportunity would ever arise again. During that first visit Shri Mahayogi planted the seed of Truth, and as it begins to sprout, he is carefully watching over it. Shri Mahayogi visited Taiwan for the second time last year for nine days, from October 19th to 27th. Three Satsangha were held and over one hundred people participated. Many had eagerly anticipated meeting Shri Mahayogi again, while others met him for the first time, after having missed the last opportunity. 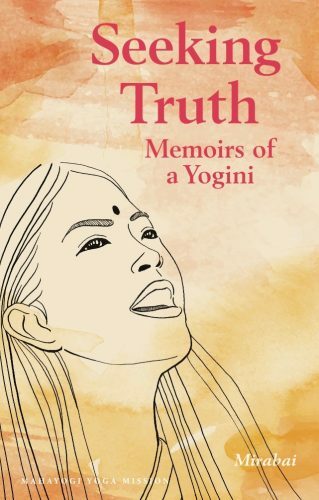 From beginning to end, Shri Mahayogi expounded upon the Truth gently and in detail. Every Satsangha was wonderful and fulfilling. Besides Satsangha, Shri Mahayogi also allowed opportunities for gurubhai in Taiwan to interact with him on several occasions. In each situation, Shri Mahayogi answered various questions from them, and gave blessings and sincere words that helped propel everyone further along on the path. Every situation spontaneously became a Satsangha. Now, the testimony in this issue is a translation of an article that was contributed to Paramahamsa (a bi-monthly publication in Japan) and is written by a new staff member in Taiwan, Zhao Yuan, after Shri Mahayogi’s second visit in October. Zhao Yuan, a graphic designer, had already become involved with making the flyer for Shri Mahayogi’s first visit, before even meeting Shri Mahayogi. 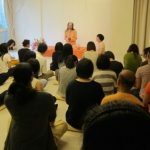 And after meeting him and being inspired by the Master’s presence, he has spontaneously started to participate and support the activities of our sangha in Taiwan more and more, and is now walking the path along with us. With depth in his simple and straightforward, yet beautifully expressed writing, Zhao Yuan gives testimony to what he has recognized through practice about the true significance of having had the opportunity to learn from Shri Mahayogi. 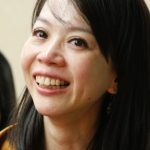 And in addition to Zhao Yuan’s article, we would like to share here the translation of another article that appeared in Paramahamsa, which is written by Prasadini, who has been central to the activities in Taiwan. Although it may not be that long ago that the sangha in Taiwan began, she herself, along with the new sangha, strive to keep walking on the path itself. And Prasadini’s candid and sincere writing, reflecting exactly that, also brings us fresh energy and much inspiration. After Shri Mahayogi’s visit in May, Taiwan entered a period of scorching weather. 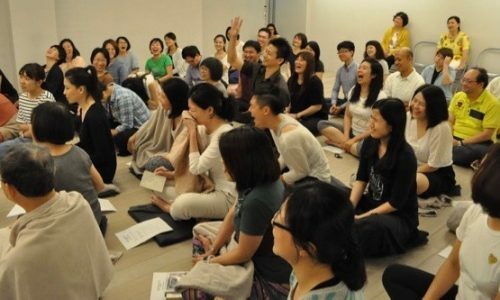 In Taipei, we continued to have Asana and Meditation Class twice a week, and Meditation Group every other week. Both events at times had many attendees, while at other times, there would be very few. After having received the joy of our hearts being suddenly opened, we all went back to the routine of our busy daily lives. Perhaps everyone may have noticed that even if you meet Shri Mahayogi a few times, your original life does not change that much. The relationships you must face, various issues with family, and personal financial situations, continue to exist. At the same time, I suppose that having been given so much encouragement and having the fire of passion lit by Shri Mahayogi, many of us have felt that there is something that is different than before. During class or meditation, we have continued to ponder further and debate Shri Mahayogi’s teachings, and also to discuss how we can check the challenges that occur in our daily lives against the Truth. In fact, we have begun to realize that in actuality that is the difficult part. How can we live in conformity with Truth? Even if we know the right thing to do, why do we resist? Why can’t we do it? We have all struggled in the past five months, following Shri Mahayogi’s first visit. However, we are very blessed. Shri Mahayogi, deeply merciful and compassionate, visited Taiwan again after five months. Shri Mahayogi must have heard the cries within our hearts. Three Satsangha were held during Shri Mahayogi’s visit in October. In the last visit, for almost everyone, it was the first time to meet Shri Mahayogi, but this time, over half of the participants met him for the second time. Participants deepened their trust towards Shri Mahayogi, and became more honest and willing to open up when they asked him questions. Upon hearing this, I saw that some people had tears in their eyes, perhaps they finally understood the purpose of the efforts they had been making, or perhaps they were finally able to let go of anxiety or self-loathing. Fear, hate, attachment, sadness—whatever we pick, what we are facing is actually our own minds. However, the mind’s habits are much more stubborn than we can even imagine. Even if it hears the words of Truth once, the mind may make excuses and take the path of least resistance. But, at that moment when we all thought it was very difficult to transform the mind, Shri Mahayogi did not mention whether it was difficult or easy, but instead he encouraged us again to just keep practicing. Indeed, there is no need to feel down by the preconceived notion that it is difficult to make a change in the mind: we just have to continue to discipline ourselves to apply the teachings and put them into action. After the third Satsangha ended, I thought about it again. What amazing work Shri Mahayogi is doing! Our stubborn heads bind us with dark doubts and suffering, but Shri Mahayogi shines rays of light onto them from many different directions, with his humorous words, filled with compassion and wisdom. We cannot solve these difficult queries with our own intellect but only Shri Mahayogi’s existence can bring about absolute transformation. For this one week, we were so fortunate to be able to receive this gentle, direct instruction from Shri Mahayogi. We will continue to learn and make an effort to apply the teachings and put them into action. Shri Mahayogi, please visit us again in Taiwan to continue to guide us! then all the lotuses (the chakra) and the knots (granthis) are pierced. where there is no pain, is to be reached. He who knows her knows Yoga. The Kundalini is described as being coiled like a serpent. Kundalini…perhaps you have heard of it? It is the great force of prana that lies dormant at the base of sushumna nadi, the base of the spine. Although it is referenced a number of times in the Hatha Yoga Pradipika, one of the classic Yoga scriptures, most likely the majority of people nowadays have heard about it in reference to some kind of fantastical spiritual experience, or at the very least, in relation to the opening or activation of the chakra, the various energetic centers that fall along the path of the spine. But even though talk of “spiritual experiences” is now often intertwined with talk of “kundalini” or “chakra,” how much do we really understand about what it all really is? And how often do we encounter a teacher who can truly guide us based on his or her own intimate experience of it? This month’s Pranavadipa (Vol. 39) gives us a unique glimpse into this very topic. Shri Mahayogi graciously responds to the inquiries of a seeker as she strives to make sense of her own experience of changing prana and understanding of the rise of kundalini. Shri Mahayogi not only expounds on the more technical aspects of prana, kundalini and the chakra, but he also speaks about the actual likelihood of the true occurrence of kundalini rising, what blocks it from rising and then guides her to practice looking beyond this phenomenon towards the ultimate aim of Yoga. Again and again, Shri Mahayogi guides seekers to the most practical methods of true application of practice that lead towards the attainment of Satori, beyond all phenomena that are mentioned in various scriptures. This month’s issue is centered on two such practical methods: the practice of humbleness and the practice of pure faith. As we walk the path of Yoga, there are many opportunities for us to receive guidance. And one of the most important ways is through our fellow gurubhai. If we look to the practice of our fellow gurubhai, we can often find clues for how to concretely further our own practice, as well as fresh inspiration. 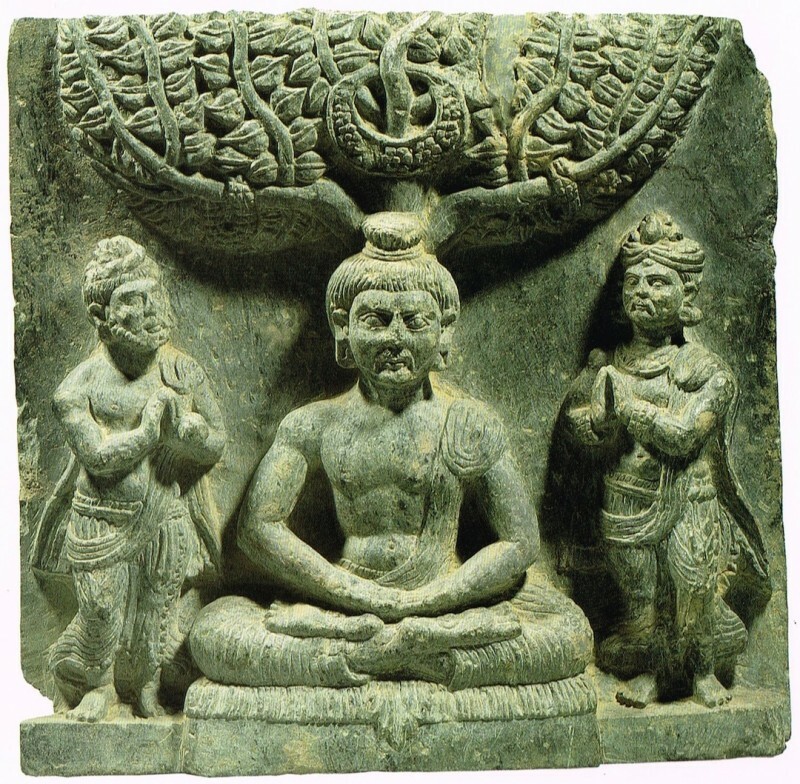 And there is no doubt this is one of the three treasures described by Buddha: Buddha, Dharma and Sangha. In this month’s Testimony (Vol. 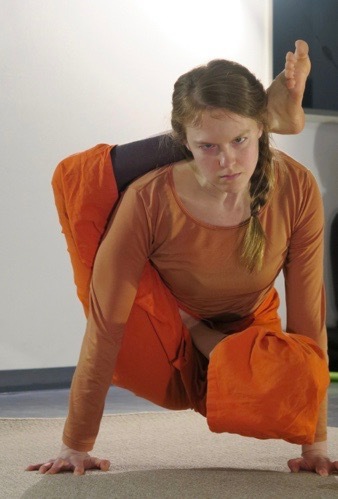 39), which touches on the key to the breath in asana, Sadhya, a disciple from New York, writes about the inspiration she received from watching Yogadanda, a gurubhai who was visiting from Japan, practice asana in the class. Five years later she would go to Japan, and interestingly enough, having advanced in her asana practice, she was then asked to demonstrate during the class for the gurubhai there, including Yogadanda. Seeing her awe-striking demonstration took everyone’s breath away. As a result, the gurubhai in Kyoto have become inspired by her practice, of course. The content of this month’s Testimony reveals a glimpse of Sadhya’s journey through the practice of asana and what she has recognized as the result of the depth of her practice as a true seeker. This also reveals what the asana practice taught by Shri Mahayogi is. She is definitely on the way to discover, with her understanding going deeper and deeper, what the true asana is that Shri Mahayogi is bestowing upon us. After the demonstration, she answered questions from the attendees. Everybody was surprised to hear that she works as a high school teacher, no different from anyone else. There were new students in the class that day, and they too were inspired to continue to practice.